Posted on Tue, May 8, 2012 : 9:17 p.m.
Ypsilanti voters rejected two revenue-generating proposals city officials said were necessary to avoid deep cuts to city services, according to initial election results. Both were rejected by wide margins. According to unofficial results posted by the Washtenaw County Clerk's office, the Water Street proposal was defeated with a 63.67 percent "no" vote. The 1-percent income tax proposal was defeated with a 64.39 percent "no" vote. Ypsilanti residents Barton Bund and Jamie Weeder leave the Ward 3 polling place at Emmanuel Lutheran Church on North River Street after voting in Tuesday's city election. Bund and Weeder both said they voted against the Water Street millage and the city income tax. The city reported a moderate turnout earlier in the afternoon with 8.2-percent of voters turning out by noon. Polls closed at 8 p.m. The proposals were integral parts of a five-year financial plan developed by city staff and city council that officials said would help avert a $6.1 million deficit projected for 2017. The income tax was set at 1-percent for residents and corporations, and 0.5-percent for those employed in the city. It was projected to generate $10 million over the five-year span. The Water Street debt retirement millage residents saw on the ballot was for 4.94 mills in fiscal year 2013. That rate would have grown to 7.12 mills by 2017. But as part of the five-year plan, city council voted to use savings to pay half the Water Street debt. That would have allowed the city to cut the millage rate in half. In that scenario, homeowners would have paid a millage rate of 2.35 mills in fiscal year 2013, and would have grown to 3.55 mills by 2017. The full millage was projected to generate $7.7 million. Wed, May 9, 2012 : 8:51 p.m.
YpsiLivin......You said &quot;there is no going back on existing pensions unless voters in the state alter the state's constitution.&quot; Well that is exactly what we will do because you can not expect the working people of this State or city to continue funding the public employee's retirement and medical for the rest of their lives while continuing to ask us for more money in taxes. we will not stand for this and we will show you and any others that doubt us that we can change this and we will alter the constitution to show the will of the people as it should be. Thu, May 10, 2012 : 12:54 p.m.
Go for it! The next opportunity to vote up a Constitutional Convention will be in 2026, and you'll need to get the majority of voters in the state to approve the ballot measure authorizing it. If you start now, you just might make it happen. Wed, May 9, 2012 : 4:08 p.m.
A little history for the uninformed. Water Street was a typical urban renewal project hyjacked by the drop in housing values starting in 2006, which had never happened to Michigan before. The developer bailed and left Ypsilanti with a huge amount of property. The old residents of the area were marginal business ,not upgrading the property, on the edge of the river, with poorly planned roads and infrastructure. It looked bad and affected Ypsilanti's reputation. Ford/Visteon bailed around the same time. Wed, May 9, 2012 : 4:14 p.m. The mayor then, Cheryl Farmer, is a wonderful MD, who loves Ypsilanti and with the best of intentions wanted to help Ypsilanti upgrade and fix itself. She never gained from the project and just didn't forsee this drop in property values. I didn't either, ask yourself did you? Wed, May 9, 2012 : 12:58 p.m. 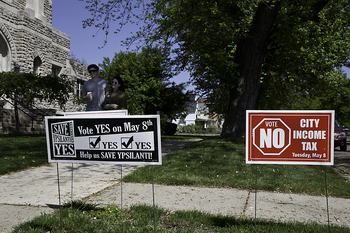 I am happy to see that the citizens of Ypsilanti did the right thing by voting NO. Now we may be able to look at the benefits and pensions the public employees are getting, This is all paid for with our tax dollars and they are unwilling to sacrifice like we the tax payers are currently doing. Once we get these employees on a 401K, a medical plan that requires them to pay a large percentage in and delete their pensions we will start to see money available to right this city. Wed, May 9, 2012 : 12:56 p.m.
Chase you are 100% correct. I hope everyone can understand what you are saying. Wed, May 9, 2012 : 11:42 a.m. Wed, May 9, 2012 : 11:39 p.m.
Public sector union members think they can take taxpayers' money for their own pensions and health care for the rest of their working years, that the tax money never runs out. But the smaller the private sector becomes, the smaller the amount of tax money available becomes. The smaller the government, the more freedom and opportunity for the entrepreneur. Wed, May 9, 2012 : 1:01 p.m.
An EFM can change these contracts and he will...........this practice can not continue as is unless you want to see this city dissolve itself. Wed, May 9, 2012 : 12:52 p.m. Wed, May 9, 2012 : 12:50 p.m.
&quot;...too weak and &quot;too greedy...&quot; Sorry, my fingers aren't cooperating. Wed, May 9, 2012 : 12:06 p.m.
Rewriting history to fit your own warped perspective seems to be a very rewarding passtime for lots of people in the area. Good luck with that. People who go to work for just about any employer in this state are forced to either join a union or pay does to one, whether they like it or not, as a condition of employment, backed up by state law. Today's self-proclaimed &quot;small business owners&quot; are a class of people who have been too weak to stand up for what's right in the legislature, and to scared and greedy to challenge the status quo in this state. Wed, May 9, 2012 : 12:03 p.m. Your &quot;emperors with no clothes&quot; are the firefighters, policemen, and administrators that make the profitable conduct of life and business possible in our community. And they don't look like they're living large to me. Wed, May 9, 2012 : 10:33 a.m. I don't doubt that those behind the Water Street fiasco deserved to have a message sent. I am relatively new here, so I don't know the full history. However, I do wonder how defeating this measure makes the city any better. Do we no longer owe our debts? Is there some previously hidden income source that can now be tapped? The best suggestion I've seen here so far is to renig on our obligations and beg our creditors (and retirees!) to let us off the hook. Maybe I should try that with the bank that holds my mortgage and see how it works! Wed, May 9, 2012 : 4:28 p.m. Wed, May 9, 2012 : 2:06 p.m.
&quot;The best suggestion I've seen here so far is to renig on our obligations and beg our creditors (and retirees!) to let us off the hook. Maybe I should try that with the bank that holds my mortgage and see how it works!&quot; You can, its called letting your home go into foreclosure and then filing bankruptcy. Wed, May 9, 2012 : 9:49 a.m.
Congratulations to the residents of Ypsilanti. I envy you. In Ann Arbor, all anyone needs to say is &quot;it's for the kids&quot; and the residents will vote for it, even in the face of clear wasteful spending, shady overnight votes to give raises to staff, etc. Ann Arbor residents just seem to LOVE raising taxes. Wed, May 9, 2012 : 3:38 p.m.
Ann Arborites will gladly slurp up any tax that's billed as a way to preserve or improve their property values. The kids have nothing to do with it. Wed, May 9, 2012 : 9:11 a.m.
Help me refresh my memory. Who was the mayor and council members at the inception of the Water St. project, and how did they vote? Wed, May 9, 2012 : 4:07 p.m. I'm not playing the blame game. Water Street was a typical urban renewal project hyjacked by the drop in housing values starting in 2006, which had never happened to Michigan before. The developer bailed and left Ypsilanti with a huge amount of property. The old residents of the area were marginal business ,not upgrading the property, on the edge of the river, with poorly planned roads and infrastructure. It looked bad and affected Ypsilanti's reputation. Ford/Visteon bailed around the same time. Wed, May 9, 2012 : 6:38 a.m.
Ypsi's in dire straits, but 25 percent of the residents are living below the poverty line, and they aren't the ones who should be expected to foot the bill for years of local government waste and mismanagement. Wed, May 9, 2012 : 3:28 a.m.
Maybe the city fathers will actually have to sell some property on Water Street to...gasp...a developer or something...to recoup from this defeat. Wed, May 9, 2012 : 4:30 p.m. They have been trying. Do you have a buyer? Call them. Wed, May 9, 2012 : 3 a.m.
Our local elected leaders once again demonstrate the have their fingers on the pulse of the residents they represent. NOT! Wed, May 9, 2012 : 4:31 p.m.
History posted now, please read it, lets move forward. Wed, May 9, 2012 : 2:53 a.m.
&quot;Both were rejected by about a 2-to-1 margin&quot;.....at last....voters are holding government employees accountable for wasteful spending. Maybe now government will listen and spend the voter's money wisely. Time to wed out the Ficano/Kwame types. Wed, May 9, 2012 : 2:38 a.m. They should consider selling naming rights to the water tower on cross. I am sure godaddy.com could use it for a super bowl commercial. Wed, May 9, 2012 : 2:31 a.m.
After back to back defeats, it is time the council took direct measures to right the ship. The residents do not want more taxes, right or wrong, good or bad. The electorate has spoken (again) so it is time to listen. Wed, May 9, 2012 : 2:04 a.m.
Can we say emergency manager? Wed, May 9, 2012 : 2 a.m. I can never understand why a smallish city with bad roads, several bad neighborhoods, much blight, high crime, mediocre to bad schools, and poorly kept parks with low amenities...somehow demands high taxes from its citizens. It's not for nothing that Ypsi is jokingly referred to as &quot;Little Detroit&quot;. Wed, May 9, 2012 : 5:01 a.m. It seems obvious that you don't live in Ypsi. Wed, May 9, 2012 : 2:11 a.m. Please sir. You do the city an injustice. Around here we call it Ypsi-tucky. Wed, May 9, 2012 : 1:59 a.m.
Where are all the people crying about two elections per year, May and November? Or, do those unpatriotic people only live in the Ann Arbor School District? Wed, May 9, 2012 : 1:57 a.m.
also rezone the water street area to multiple use and start selling the land for development. Even a burger king would pay more taxes then an empty lot. Wed, May 9, 2012 : 1:55 a.m.
Now that this issue is over, we need to focus on where our effort should be. Get a state amendment that requires the state to pay their required part of the profit sharing revenue from the state funds. it should be based upon the percentage of revenue generated from specific sources and payed out based upon population. Not this area where special interest groups get more of the funds. For instance lets say the starting point would be 50% of the new Business tax; the Alcohol tax and the sales tax. divided by the total population of the state as determined by the census and paid to the cities. I could also see a split between the city and the county at a 80/30 split. with the most going to the cities. Call in our reps and require this be submitted to the legislature. If they don't move on it in 60 days we begin a signature drive to put it on the November ballot. Or better yet start the drive now. we have had the same problems with the last three Governors and state legislatures. Wed, May 9, 2012 : 1:50 a.m. Wed, May 9, 2012 : 9:08 a.m. I haven't seen any of the anti-tax side say what Ypsilanti will look like after &quot;the fat&quot; is cut. Wed, May 9, 2012 : 1:44 a.m.
As someone who is going to be paying a lot less in taxes this year than he voted for, I think this is a sad day for Ypsi. Wed, May 9, 2012 : 1:51 a.m.
You can always donate that difference to the city. I'm sure they'd be happy to have your $$, and there's nothing stopping you. Wed, May 9, 2012 : 1:47 a.m. Wed, May 9, 2012 : 1:38 a.m.
2 to 1 margin says a lot and says it loud and clear. This current leadership needs to do some soul searching, regroup and then se how they step aside and let new leadership take over. This era is over. Wed, May 9, 2012 : 1:31 a.m. I felt confident that both measures would be defeated. I have heard a number of people argue about moving elsewhere if the income tax passes, and I think it is a lot of hot air. Ypsi is a great place to live, with a wonderful history, beautiful campus, and diverse population. Not easily duplicated elsewhere for the price. The real reason for voting no is that it is ridiculous to pay back the full value of the Water Street bonds. The muni market is terrified right now of a wave of defaults, as there are thousands of cities around the country unable to meet their debt payments. There can, and should be a re-negotiation of debt. At the same time, adjustments will have to be made to pensions. That is a fact. This is a large part of Ypsi's operating costs, and it has to be addressed. Finally, we need to flip the state government back to one that values and supports communities. I see Snyder as a complete failure in this regard. The &quot;small business&quot; tax breaks have helped create thousands of jobs, in China. There should be a performance metric on those tax cuts. If it doesn't help the state, and its cities, then give it back. Wed, May 9, 2012 : 1:26 p.m. I agree, hire a city manager immediately. The Road Commission candidate is the most seasoned and experienced candidate. I believe he has a lot to offer if council would open their eyes. Wed, May 9, 2012 : 1:13 p.m. Wed, May 9, 2012 : 4:30 a.m. Wed, May 9, 2012 : 3:37 a.m.
Spot on YpsiVet. If you promise money to someone, especially a first responder like police and fire, you need to pay it. If not, why would you want to live there? The contracts were garbage, but almost every city in the US had em. So where does the city go forward from here? Wed, May 9, 2012 : 3:21 a.m. Wed, May 9, 2012 : 1:49 a.m.
Well that is the rub. Ypsilanti might have all the things going for it you state, but if you are a home owner it is not cheap to live in Ypsilanti. My parents own ten acres in A2 right on the river with 3500 feet of space inside the home. They pay less in property taxes than I do on less than an acre in Ypsilanti. Further, the services are poor compared to some places like Grosse Point, which also has lower property taxes and the City shovels the snow on the sidewalks. Wed, May 9, 2012 : 1:30 a.m.